Forex market runs 24 hours, 5 days in a week.Yes it does. But in this 24 hours time period so many trading sessions open and close. The boss sessions of forex trading are Now York, London, Asian/Tokyo and Sydney. The table above presents the opening and closing time of major forex trading sessions. Mentionable, Tokyo session is referred to Asian session commonly. From the above table, we can easily find the opening and closing times of major trading sessions. The opening and closing times in summer and winter are different because in some countries Daylight Saving Time is applied. Different trading sessions have different characteristics that can be applied by the traders in their trading . For example, the average daily pips movement of the currency pairs defer among trading sessions. In the above table you can find the average daily pips movement of the currency pairs. It is measured analyzing some past data. Which currency pairs should be traded during Asian session? Tokyo session is referred to the Asian session because Tokyo is the financial capital of Asia. The opening of Tokyo session is marked as the opening of Asian session. Mentionable, Japan is the third largest forex trading session in the world. Another remarkable point is that the yen is the third most traded currency which partakes 16.50% of all forex transactions. About 21% of all forex transactions take place during the Asian session. Trading yen currency pairs can be very profitable during the Tokyo session. The exporters of heavily export oriented Japanese economy participate in this session. During this session, important economic news of New Zealand, China, Japan and Australia are released. As a result, AUD, NZD, JPY currency pairs show high volatility in the session. Canadian dollar also shows higher volatility during the Asian session because it is positively correlated with Australian Dollar. Which currency pairs should be traded during London session? London session overlaps the Tokyo and New York trading sessions that made the London session such a key financial center in the world. A huge volume of currencies are traded in the session. During London session almost all currency pairs can be traded. Specially, major currency pairs can be profitably traded during this session. A huge volatility can be seen in the movement of almost all currency pairs. Which currency pairs should be traded during US session? 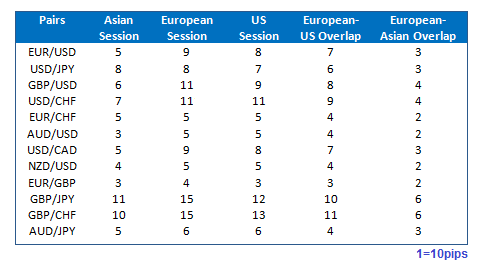 US session opens when the European session is almost matured. As the US session overlaps the European session when it starts, at the beginning of the US session a huge volatility is found in the market. 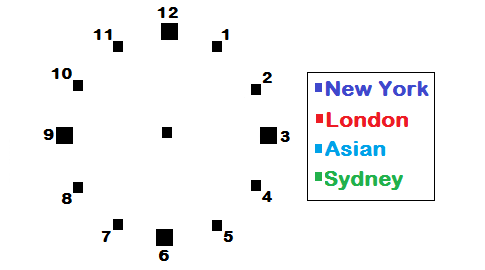 All major pairs and all crosses can be traded during this session. Many US economic news release in the session, and the releases provides handy volatility in the market. Even the scheduled economic news in US session sometimes create a calmness at the end of the London session. During the overlaps between two sessions, currency trading is profitable because the currency pairs become more volatile. Following are the overlaps between the largest trading sessions. From the above table, you can find the the average pips movement by some of the currency pairs during different trading sessions and overlaps. It can help you in selecting the the right currency pairs to trade. Dear Friends, If you have any questions, you can drop a comment below.